This is a no brainer recipe on my blog considering the quality of steaks I can get here in Alberta. 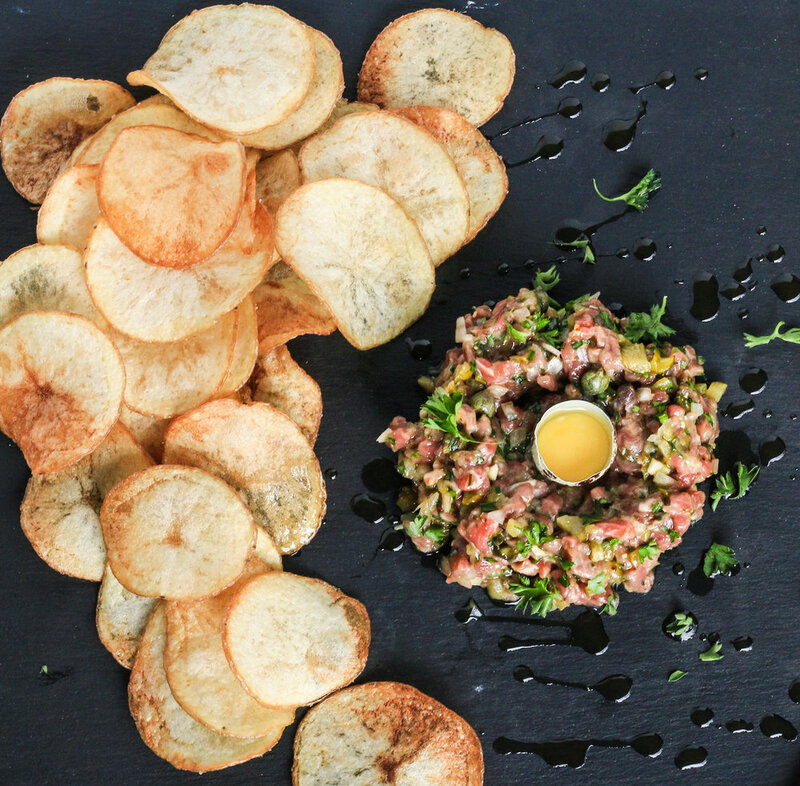 The highest quality and freshest beef and eggs are a must when making a tartare. Homemade potato chips are a nice touch but can easily be substituted for your favourite brand of store bought chips if you are short on time (or you don’t like to deep fry in your house, which is understandable). Slice the potatoes paper-thin with either a mandolin or the slicing attachment of your food processor. Once sliced, place in a bath of cold water to remove excess starch, drain water and refill again. Let the potatoes soak for 30 minutes, drain and rinse one final time. Dry completely. Fill a large Dutch oven halfway with oil and heat over medium high until the oil reaches 350F. Fry the potato chips in small batches, until they turn golden brown around the edges, flipping halfway through frying. Remove from the oil with a slotted spoon and place them on a bed of paper towels to absorb any excess grease. Season with salt. The chips will crisp up as they cool so don’t worry if they feel a little soggy at first. 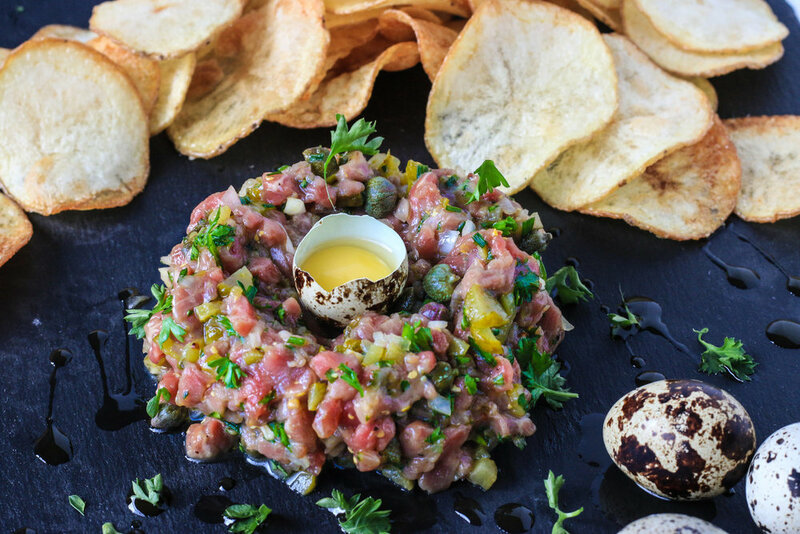 In a medium sized mixing bowl, combine all ingredients for the tartare except the quail egg yolk. If you want the presentation shown in the photo below, place the tartare in a ring mold and press down evenly. Top with the quail egg yolk and place potato chips on the side. If you prefer the presentation in the above photos, place a mound of tartare directly onto a serving platter, making an impression in the middle to hold a quail egg. Separate the yolk from the white and place the yolk back in the half-shell. When eating, break the quail egg yolk and stir it into the tartare. Make sure you keep this cold if it’s not being eaten right away.